The most consistent nonprofit consultants - hands down. At 21, Stephanie joined her first Board of Directors for a community radio station at her alma mater in Southern Maine. She was nominated for the fundraising committee. Her introduction to non-profit fundraising began with Mardi Gras Jumbalaya cooking contests and the famous Beg-A-Thons where she raised her first thousands soliciting support from the DJ’s chair. After graduating with a Bachelor’s, Stephanie moved to Central Europe and started an independent consulting business, becoming licensed to teach Business English to CEO’s and executives in Prague, Czech Republic. She worked with companies such as MAERSK, Verizon, and Czech government officials preparing them with business language skills to host the seat of the European Union in 2008. Returning to the United States, Stephanie taught at the University of New Haven and continued volunteering as a nonprofit board member, planning fundraisers and raising support. In 2010 she moved to New Mexico to complete a degree in Language, Literacy and Cultural Studies at the University of New Mexico. At UNM, Stephanie worked with staff and graduate student leaders to streamline the grant making process for students searching for research funding. She secured funding streams from the College of Education for future student use and trained a team of grant-readers and grant writers. After graduating in 2012, she began working for local nonprofits as a full-time employee. In short order, Stephanie sought more dynamic work. In 2016, she founded Sample Consulting Studio to support growth in the nonprofit community as a new generation of leaders and best practices emerges. She has raised over $2.5 million for nonprofits in New Mexico since 2012. Stephanie brings both foundational best practices and innovative perspectives to fundraising, fund management and organizational development. She believes that the time for social enterprise is now more than ever, and that as nonprofits learn to grow and develop business principles and mindsets, our sector will only become stronger and more self-supporting. Patrick earned his BBA from the Anderson School of Management at the University of New Mexico, concentrating in Entrepreneurial Studies, and his MBA in both Policy & Planning and International Management. He has worked with several small businesses, startups, and nonprofit organizations, training under Dr. Manuel Montoya and Jean Block. His specialties include business strategy development, social and environmental impact analyses, organizational structure creation and development, board development, fundraising strategies, communications and marketing strategies, and social enterprise solutions for nonprofits. Recently, he traveled to Guatemala with the Social Entrepreneur Corps as a consultant to Soluciones Comunitarias, developing their organizational capacity to provide high-social-impact products (water filters, reading glasses, fuel-efficient stoves, etc.) through the MicroConsignment entrepreneurial model. Jean began her experience with the nonprofit sector in 1955 when she was 13 years old. She organized a backyard carnival which raised nearly $500 and she was hooked. She has served as leadership staff for several nonprofits, including the Cystic Fibrosis Foundation of New Mexico, a local hospital and the United Way of Central New Mexico. And, in the years since organizing that carnival fundraiser, Jean has been a volunteer leader with numerous local, regional and national nonprofits, including health and human service organizations, membership organizations, performing arts organizations, and advocacy groups. In 1995, Jean formed her own consulting company to enable her to share her expertise in nonprofit management, fundraising, planning and Board development with a broad range of local and national nonprofits. She now travels extensively in the US, teaching workshops and consulting with nonprofit of all sizes and scope. In 2003, an opportunity to learn about social enterprise led Jean in a new direction. For three years, she taught the PathFinder program for the National Center for Social Entrepreneurs, helping 25 nonprofits on the road to self-sufficiency. 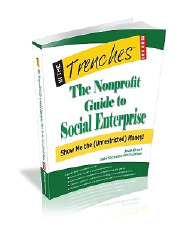 In 2006, Jean formed Social Enterprise Ventures, LLC to build on her extensive knowledge base of nonprofit management and social enterprise training.